LUCY BURDETTE: Today, the day before Thanksgiving, when many of us are up to our ears in menu planning or pie crust rolling or sitting in traffic on the way to grandma's house or (lord help us) the grocery store, I wondered what I could post that might be entertaining without being demanding. And it occurred to me that you might enjoy a few snippets from A DEADLY FEAST, the 9th Key West mystery, coming next May--because it's set at Thanksgiving. On Monday we chatted about our menus and guest lists, today you'll hear about Hayley's! Here's the final artwork--isn't it pretty? And I love that Jenn's quote is on the cover...In this story, Hayley is helping to investigate the death of one of the customers from a food tour. Chef Martha Hubbard worries that someone sabotaged her key lime pie. Bill opened the door to the cooler and gestured at the shelves, overflowing with turkeys, sacks of Brussels sprouts, slabs of bacon, onions in net bags, and more. My stomach let out a loud rumble and they both laughed. I’d begun to salivate at the sound of those recipes, almost drooling like one of Pavlov’s dogs. She dumped a blue ceramic bowl of dough onto her floured counter. Then she began to knead it, stopping at every turn to sprinkle fresh rosemary leaves on top and knead those into the mixture. “Smoked turkey with a honey vinegar glaze and red-eye gravy, confetti succotash, mashed potatoes with cream cheese, sour cream, and scallions, the usual,” she said, finally cracking a smile. I helped them ferry all the dishes out to the sideboard in the dining room—the turkey, gravy, Sam’s cornbread stuffing, pumpkin biscuits, pasta with sage and roasted squash, green beans almandine, and an enormous salad topped with walnuts, dried cherries, mango, and goat cheese. Then my mother invited everyone to grab a plate and fill it. 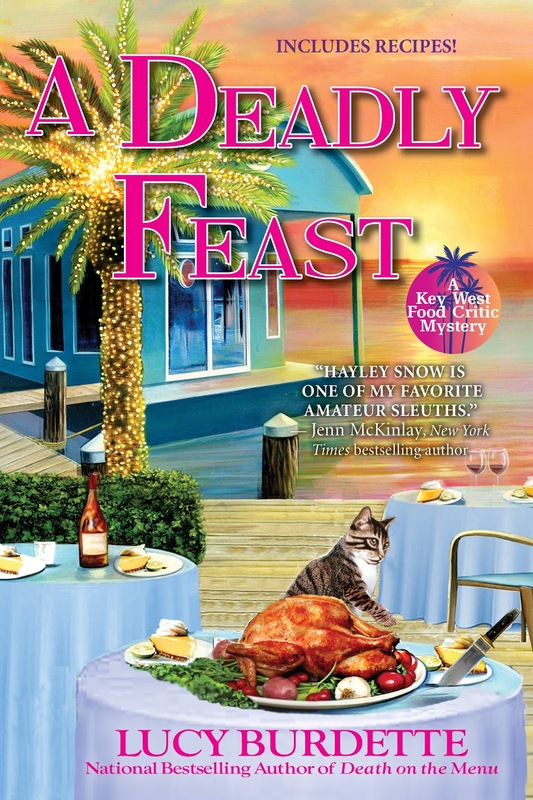 A DEADLY FEAST blurb: Before Key Zest food critic Hayley Snow's family descends on the island for Thanksgiving, she has one last assignment--a review of a seafood tasting tour conducted by her friend Analise Smith. But when one of the tourists collapses on the last stop, Analise begs her to investigate before the police destroy her business and shut down the local Key West eateries on her tour. Pressure mounts when Analise calls a second time to request that Hayley meet with Chef Martha Hubbard, who prepared key lime pies for the tasting tour and is terrified that someone poisoned her pies to ruin her reputation. Chefs all around town are preparing their versions of a Thanksgiving feast, but with a murderer on the loose, will Hayley and her friends have anything left to be thankful for? Available for pre-order from Indiebound, Amazon, Barnes and Noble, or wherever you buy your books. Yum! I want to have Thanksgiving dinner with Hayley . . . .
Oh, Lucy! Thank you for including Miss Gloria. She is one of my favorites. I love that cover, and the book sounds great! Happy Thanksgiving, everyone! Congratulations on the forthcoming book, Lucy! It sounds delicious. The book sounds great, Lucy - thanks for sharing those snippets. And Happy Thanksgiving! What a cover! The sunset over the water, the palm tree with fairie lights, the food and, of course, the knife! I am looking forward to reading this new book! I'm so excited a new book will be out in a few months. I hope there will be an audio too loved having both! Yes, there will be an audio version too. It was fun to listen to DEATH ON THE MENU read aloud for the first time--thanks for asking! I read the excerpts and was hooked. Happy Turkey Day! It's always fun to follow Hayley on her sleuthing adventures! And the food! I'm hoping these recipes will be in the book. There will be recipes for sure, more of them from Hayley's family than from the Chef. Except for hmmm, the key lime pie that may be poisoned--that will be available! Thanks so much everyone! I love the cover too--these artists are amazing. And of course, Miss Gloria is front and center. She seems to steal the show! Great timing,Lucy! The cover is fabulous and can't wait to read the latest with Hayley and co.
There’s probably plenty of people like me, who enjoy reading stories set at the holidays out of season. So wonderful, Lucy! This is so perfect—and what a fun cover!! And I love the logo. Are you getting hats made with it? Stationery? T-shirts? Spatulas? Glorious cover the sunset is perfect and I'm expecting the green flash as soon as the sun sinks below the horizon - have you seen it? Can't wait to read about Hayley's Thanksgiving. Oh perfect, I should have thought to ask them to include a green flash. Yes we've seen it quite a few times. Always special! Congratulations on the upcoming book! One of the things I’m grateful for is the continuation of the Key West books! I love the cover! After Tai Chi class I need to make one more trip to the grocery store for fresh fruit. Perhaps the class will leave me in a relaxed frame of mind? and I'm grateful that you're grateful. Good luck at the store!! Great cover! Looking forward to reading it. I LOVE the cover, Lucy, it's absolutely perfect. But I want to read it NOW!!! Although I think it will be fun to celebrate Thanksgiving in May. Can't wait to meet up with Hayley and the gang again. I'm so thankful to have another Hayley book to look forward to. The cover looks like a Norman Rockwell turkey came to Key West! All the best to you fine women. Happy Thanksgiving. and to you too Libby!! I love this bright, happy cover and. Yummy food. thanks Rhys, and you too! Naughty kitty. ;-) I can hardly wait for this book to come out . . . May is ages away. that's a very good motto Mary! Looking forward to the latest book! Maybe by next May I'll be able to bear Thanksgiving again. Thanks, I needed that, as they say. I'm facing multiple tasks today and was frazzling a bit, but reading about Key West and Haley has put me in a better frame of mind. I love the cover, as always, for this new book, and I can't wait to read another Haley adventure set in my favorite place. Now, off the brown the ground beef for chili tonight and fixed the mashed potatoes to bake in the morning. I just need to coordinate oven temps and times for in the morning, too. The potatoes and oysters are both at 400 degrees for about an hour, and the broccoli casserole is at 350. I think I'll do the broccoli first. did we mention that we're all coming to your house tomorrow Kathy?? so far we've done pies--chocolate cream and cherry!--and yeast rolls...happy Thanksgiving to you and yours! Lucy, the cover looks great. As for my Thanksgiving preparations...well, I have none to make. I've been told what time the food will be on the table so all I have to do is show up. I asked what I could bring and was told, "your appetite". As those Reds who have met me can attest, that's not a problem. So other than being stuck at work waiting for a truck to come pick up an order shipping out, tonight will be dinner and trivia at the 99.
thanks Jay, sounds like you'll have excellent hosts! Beautiful cover! And can hardly wait to read the book! Thanks for giving us this sneak peek. Happy Thanksgiving to all! Beautiful! I hope you had a great Thanksgiving! Thanks for the sneak peak! So happy we'll have another Hayley so soon. Happy Holidays!